“Lottie-Mo” b/w “Lover of Love” was one of possibly five [as per the R&B Indies discography] singles released on the New Orleans-based Valiant label before its owners, Joe Banashak and Irving Smith, had to rename it in 1961, due to a dispute with a California label of the same name. They re-christened the imprint Instant to go along with Banashak’s Minit label, and kept the saxophone inside the first letter as part of the logo. As Instant, the label lasted over ten more years and issued some of the city’s best sides. But that’s only part of the back story of this release, which is significant for several reasons besides being a fairly rare record containing two good New Orleans tunes by one of the city's all-time favorite singers, Lee Dorsey. It was the result of his second recording session, following “Rock Pretty Baby” b/w “Lonely Evening”, issued on Cosimo Matassa's Rex label in 1959. As well, Lee's Valiant single was his first opportunity to work with Allen Toussaint, arranger and pianist on the session, who wrote "Lover Of Love". A bit later, Toussaint did some arranging and writing for the singer's Fury sessions, and would successfully team with him to make numerous hits and great recordings from the mid-1960s to the late 1970s. 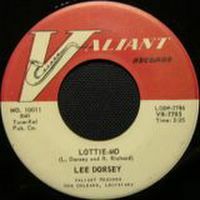 Dorsey’s co-writer on “Lottie-Mo”, Reynauld Richard, was Lee's manager, a local record producer and hustler who had discovered him at an auto repair shop, singing while he worked. Together, they wrote a few tunes which helped Richard get the singer into the studio and launch his music career. “Lottie-Mo” featured Dorsey’s simple, relaxed vocal style over an upbeat, syncopated New Orleans shuffle. Throughout, Toussaint ran funky, Professor Longhair-inspired piano riffs, and iced the cake with an impressive solo. When the record did well locally with radio play and sales, ABC- Paramount optioned a reissue for national distribution; but it failed to make a significant mark. The song did catch the attention of Marshall Sehorn, who was a promoter and talent scout for the Fire and Fury labels out of New York. He alerted owner Bobby Robinson, who convinced Dorsey to sign with him instead of Banashak. In the fall of 1961, "Ya Ya", Lee's first release on Fury, became a national hit for the unassuming former boxer, who still kept his day job as a body and fender man. For more detailed information on Lee Dorsey, Allen Toussaint, and Joe Banashak, I suggest you read I Hear You Knockin’ by Jeff Hannusch , and Rhythm & Blues In New Orleans by John Broven. These have long been my main sources for much of the background information I relate. Pardon my off-topic-ness, but Dan, did you know you got a plug in the New York Daily News yesterday? News travels slowly in the Deep South, Reaper. Thanks for alerting me. If I get a 1,000 hits today, I'll know why. There are so many bigger (and often better) blogs than mine, I wonder why I got a nod? Loving your blog. Glad there are NOLA freaks out there enjoying this stuff!! Well done.